The world is constantly transforming to make things easier and better than ever before. The world is no longer the same as it was — innovations in every segment are enabling us to reach each corner of the world. Disruption is a constant thing that has been impacting each segment. Advancements in every sector are allowing us to experience things better and faster. The traditional way of doing business has been transformed into a modern one. Technological advancements and educated population have contributed a lot to the growth of the contemporary business world. Today, we are able to perform our business activities around the globe within a matter of minutes. Innovations in information technology and advanced software developments have laid roots to the development of businesses. One of the most popular software that is highly contributing to business development across the world is NetSuite, and it acts as a sole resource for all the business requirements. This software made business processes simple, better, and faster. Let's discuss it in detail. Days are long gone where business organizations are restricted to limited data storage facility, configurations, and customer support. Current business world demands IT environment which is Agile enough to help them to stay in the highly dynamic competitive markets. And more importantly, present business world needs freedom of cloud. 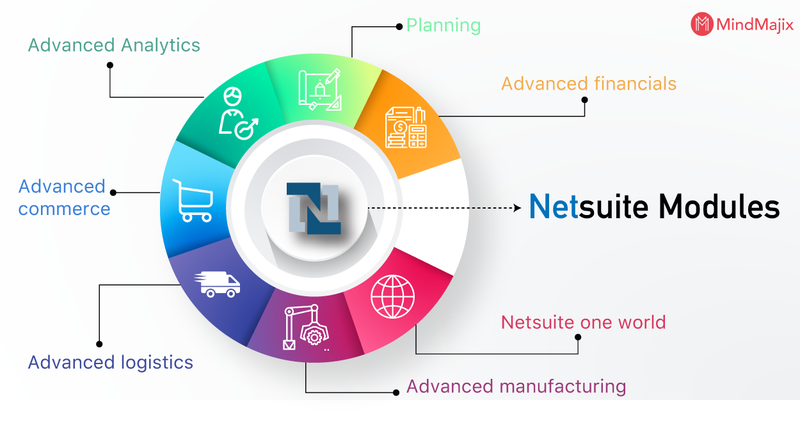 Netsuite ERP system is a power package of business tools, which includes accounting software, customer relationship management, Inventory management, order management human resource management, service resource management, payroll management, and many more. It acts as a single stop solution provider for all business-related activities. Netsuite is the most popular ERP tool across the world. Netsuite provides organizations with multiple facilities to simplify their business processes through a single system. It is best suitable for those who are looking for the centralised system with fully integrated solutions for all their business problems. NetSuite is a cloud-based ERP solution and hosted by NetSuite. We need to access it on a subscription basis. It’s ‘pay-as-you-go’ feature helps small organisations in decreasing the cost of investment in software purchase, and they can invest extra capital in their core areas of business without bothering about the software management. When entire data of an organization is available through a single NetSuite database, one can easily access their data and reports. Netsuite ERP is a cloud-based ERP solution. It automates the front and back office activities such as financial management, order management, revenue management, billing, fixed assets, Inventory management, etc. With its capabilities, it gives customisable reports to all levels of employees so that they can evaluate them very clearly and act accordingly. Its distinctive features include financial management operations, built-in business intelligence, accelerated pricing, well-designed order management suite, best in class production management suite, less investment on technology, etc, and these are the key features which made it stand apart from the crowd. Majority of the companies all over the world are using Netsuite software for fulfilling their financial needs. It is designed to support all accounting related activities efficiently. It manages operations like strong financial management, expense management, revenue management, and it allows viewing the critical financial information of the business. Netsuite software is very flexible, and it integrates very quickly with all other Netsuite software such as CRM, order management, Inventory management, etc. It takes care of complete actions right from the material procurement to reaching the final product to a warehouse. It gives us insights to look after suppliers, inventory and procurement of material, etc. Another important feature of this module is improved collaboration between the vendors and customers. We can generate financial reports whenever required. It follows all accounting standards & principles in creating realistic and timely financial statements. 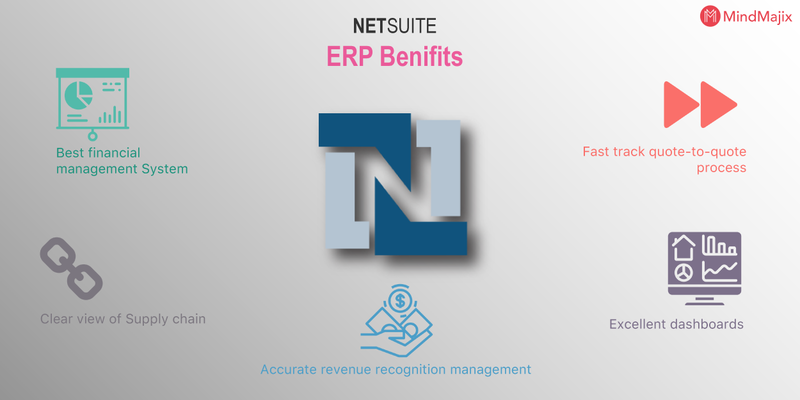 Netsuite revenue recognition management system allows you to create effective financial reports at all levels of the business process. Netsuite’s flexible dashboards enable its users to create customizable screen layouts that can be configured for the essential roles of the company. The real-time dashboard indicators indicate the key performance areas such as bills receivables, bank balance, number of outstanding bills, etc. To make it simple, it enables organisations to compare their performance with their goals. It makes them motivated and dedicated to achieving their timely goals. Manual data input not only commits mistakes but also slows down the computation process. With the help of Netsuite ERP order and Billing management module, you can quickly bring all your finance related activities together for efficient and straightforward workflow. It will help in decreasing billing mistakes and reinforce revenue recognition. It makes the selling process more comfortable. Customer relationship management (CRM) is a key feature of the Netsuite. Customers are the main pillars of any organisation, and without a proper customer base, it is very challenging to survive in the long run. A healthy relationship with customers is essential for any business. It enables the companies to maintain the relationship with the current as well as with new customers. Companies are using this software to automate activities like sales, marketing, customer service, and technological support. CRM software provides solutions to the companies which need to solve their customer-centric problems. It is designed with the applications which enable the companies to know the customer database, and they even can get to know what their customers are expecting from them. CRM enables companies to know the customer pulse with which they can start producing products and services that can satisfy customer needs. It helps in acquiring new customers and maintaining healthy relationships with the existing customers by providing better customer service. Unique and high performing features of CRM has made it an important segment of NetSuite. Following are the key features of CRM. Let's discuss each feature in detail. This feature of CRM integrates and manages sales-related actions such as opportunity management, quote and order management, incentive compensation, order fulfilment, sales forecasting, etc. This feature takes care of entire marketing related activities like creating marketing campaigns, lead generation, lead reporting, email marketing, search engine optimisation, and landing page and form creation. It helps companies in handling Customer issues and in assisting them if they have any issues with the product. It enables them in maintaining healthy and long-term relationships with the customers. Below mentioned are some of the NetSuite modules. Advanced financials: It helps in keeping a view on financial positions of different areas of a business and gives a clear vision of business performance. The bespoke module enables you to improve margins on revenue management billing, fixed asset management, multi bookkeeping, etc. It will allow the business organization to expand its growth. Planning: Netsuite software is compelling when it comes to the planning of future business related actions. It takes responsibility in allocating the resources, project management, demand planning, job costing etc, with its different modules. Advanced Analytics: Suite Analytics Connect enables you to take your business to the next level. It acts as a specialised reporting model and which plugs into NetSuite data and process required data with which we can have the analytics that we need. Advanced commerce: In order to build an advanced e-commerce business module, we need software which will support this. Suitecommerce Site builder module helps in building an online e-commerce store which supports all your B2C and B2B transactions without any disturbance. SuiteCloud premium plus allows you to handle high volume traffic to your site without any failures in between. Advanced logistics: Logistics plays a crucial role in manufacturing any product. Without proper logistics planning, it is quite difficult to place our product according to market demand. Specially designed Netsuite Logistics modules will enable automatic stock control, purchasing and maintaining inventory, cost control, and efficiency. Advanced Warehouse management modules help in maintaining the stock and thereby we can quickly achieve customer satisfaction. Advanced manufacturing: It is essential to keep in mind how much inventory is available and how much do we need to produce to maintain the balance. Netsuite advanced assemblies modules will have a track on volume and cost associated with the production. It lowers the cost and enhances the revenue. Netsuite one world: Netsuite one world financials enables companies to manage their financials globally with a single cloud financial management application. It acts as a multidisciplinary application. With the help of One world financials, companies can adjust to different currencies, taxation procedures, language and legal compliance at the local level without any impact on its overall performance. Netsuite one world gives you complete visibility of your business performance at a local and global level. There are many other essential modules of Netsuite which are contributing to the development of the Business world. In a never-ending competitive business world, we need advanced software solutions to serve better to our customers. Netsuite is equipped with a single and powerful application that works as an all-rounder for all your business needs. Netsuite is being used by 40,000 companies across the world to meet their unique needs and to reach customer expectations. Its smart techniques and set of unified applications will enable you to head towards your business goals.